Acute pelvic pain is a common presenting complaint in women and determining the etiology can be difficult. There is a broad differential diagnosis that includes causes arising from multiple organ systems (Table 1), with overlapping signs and symptoms decreasing specificity. Initial assessment is usually centered on evaluating for emergent and life threatening conditions such as ruptured ectopic pregnancy, ovarian torsion, ruptured ovarian cysts, and appendicitis. A thorough history and physical (H&P) along with basic laboratory analyses such as complete blood count, urinalysis, and pregnancy test can help narrow the differential. In women of reproductive age, the pregnancy test is paramount, as this will determine if pregnancy and its complications need to be considered in the differential, most importantly informing the suspicion for ectopic pregnancy. 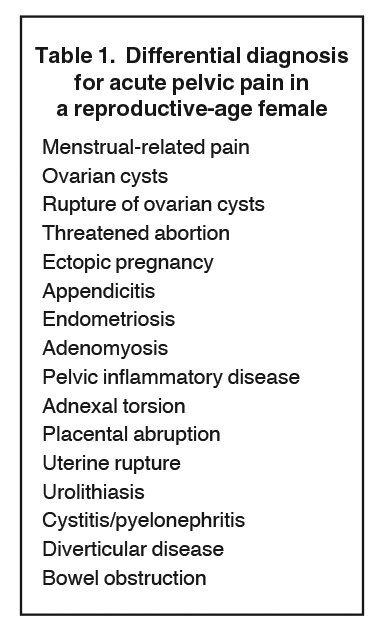 This article will focus on the imaging characteristics of acute obstetric and gynecologic causes of pelvic pain in reproductive-age women that radiologists are commonly asked to evaluate in the emergency department (Table 2). 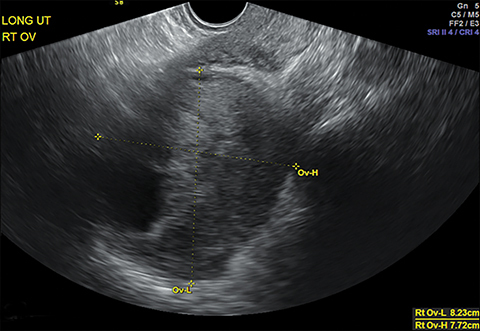 While the H&P and laboratory tests constitute the initial clinical evaluation generating the differential diagnosis, the first-line imaging test usually obtained is pelvic ultrasound (US), followed by selective use of computed tomography (CT) as indicated by sonographic findings. 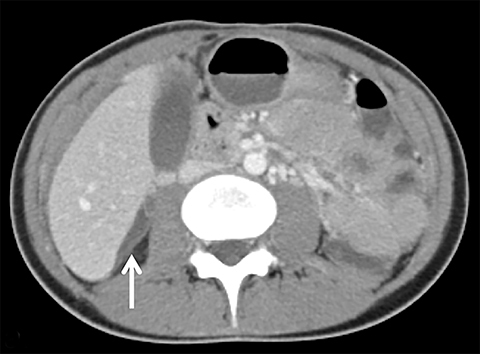 In some situations CT may be the initial imaging study, as it is generally more available than sonography, and provides more extensive coverage of the abdomen and pelvis if the differential diagnosis initially is very broad. 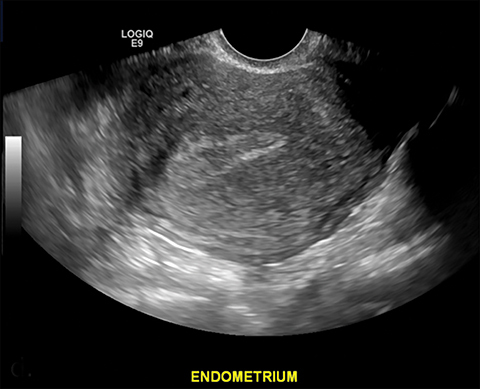 Ectopic pregnancy occurs when a fertilized oocyte implants outside the endometrial cavity. They account for approximately 2% of all pregnancies, with a 9-14% mortality rate.1 The diagnosis should be considered in any reproductive age woman who presents with acute pelvic pain and has a positive urine or serum pregnancy test. 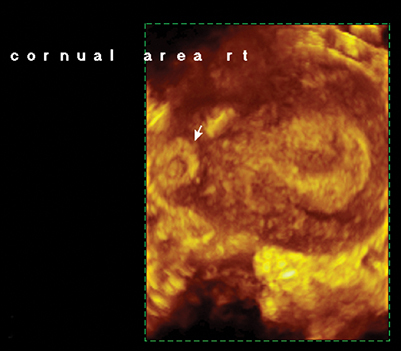 Lack of an IUP should trigger a careful search for an ectopic pregnancy. Up to 95% of ectopic pregnancies are tubal, with most occurring in the ampulla.1 Locations for ectopic pregnancies include the ovary, cervix, myometrial scars, or in the peritoneal cavity. 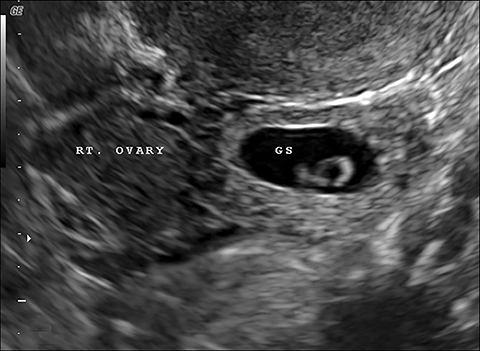 The most specific sonographic finding of an ectopic pregnancy is an extrauterine gestational sac with a yolk sac or embryo (Figure 1).3 However, in a patient without an IUP and elevated b-hCG, any extraovarian adnexal mass, separate from the ovary, is concerning for ectopic pregnancy (Figure 1). In some cases, free intraperitoneal fluid or hemoperitoneum may be the only finding. A radiologist or sonographer also has to be prepared for other imaging scenarios that can be encountered in ectopic pregnancy. They include pregnancies of unknown location and nonviable intrauterine pregnancies. Though these may not be a direct cause of acute pelvic pain, they are frequently encountered and have important clinical implications. 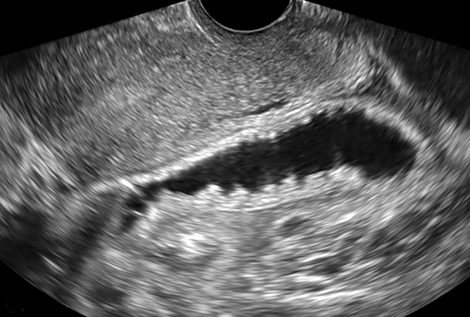 Ultrasound may not reveal either an IUP or an ectopic pregnancy in a patient with a positive pregnancy test. Historically in pregnancies of unknown location, a threshold hCG level (commonly used levels ranged from 1500-2000 mIU/ml) was used to aid in diagnosis of an ectopic pregnancy.5 Newer data questions the validity of these threshold values6 and has led to newer recommendations regarding the assessment of pregnancies of unknown location.2 The data has shown that a single measurement of HCG regardless of its value does not reliably distinguish between an ectopic and a viable or nonviable intrauterine pregnancy. Even at levels ranging from 2000 to 3000mIU/mL there is a risk of interrupting a viable pregnancy with presumptive treatment. Above 3000 mIU/mL, the more likely diagnosis is a nonviable uterine pregnancy, followed by ectopic pregnancy, with an early viable IUP not excluded, and continued clinical and imaging follow-up is needed. In those recent guidelines, Doubilet et al2 believe there is limited risk in waiting 48 hours to measure progression of hCG values in a hemodynamically stable patient with no signs or symptoms of rupture and no ultrasound evidence of an IUP or ectopic pregnancy. 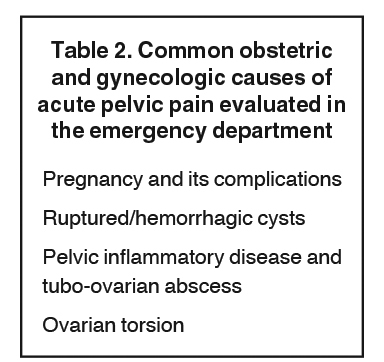 In the emergency department setting, the most common clinical concern for a pregnant patient presenting with acute pelvic pain is an ectopic pregnancy. However, there are numerous other complications of pregnancy spanning all trimesters that can present with acute pelvic pain, ranging from subchorionic hemorrhage to placental abruption. 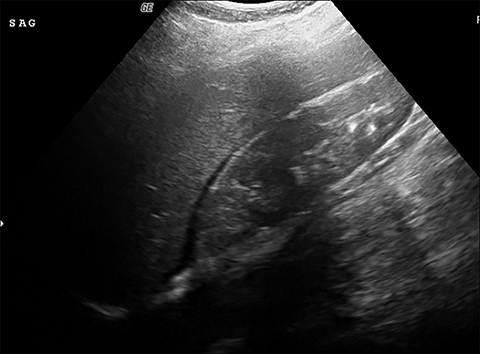 Ruptured or hemorrhagic ovarian cysts are the most common gynecologic cause of acute onset pelvic pain in a non-pregnant female of reproductive age presenting to the emergency department.3 They are infrequently seen at the extremes of age; however, they can rarely occur in postmenopausal women receiving hormonal treatments. Patients typically present with only unilateral acute pelvic pain without other associated symptoms. 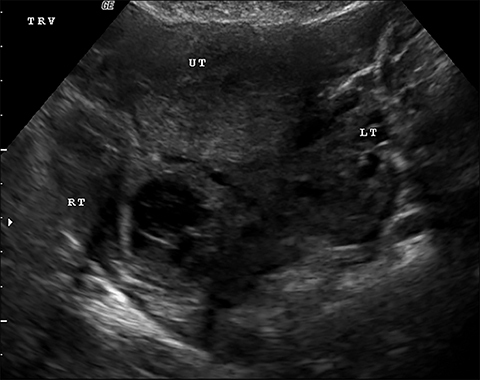 Ruptured ovarian cysts may have a crenulated appearance containing low level echoes with adjacent free fluid (Figure 2). At times it may be a diagnosis of exclusion on ultrasound if the cyst has completely ruptured and the fluid reabsorbed. Findings of cyst rupture include free fluid and hemoperitoneum, typically seen in the cul-de-sac (Figure 3). 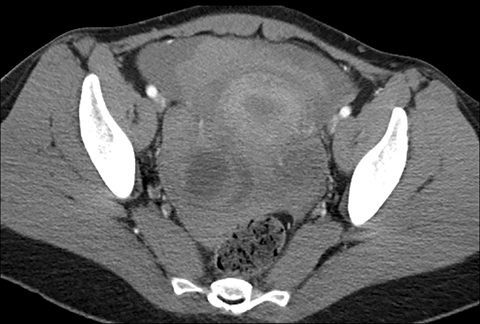 On CT, hemorrhagic cysts appear as heterogeneous ovarian masses with internal attenuation of 25-100 HU. Fluid-fluid levels and hemoperitoneum may be seen after cyst rupture (Figure 3). Treatment is usually conservative unless the patient is hemodynamically unstable from massive bleeding. 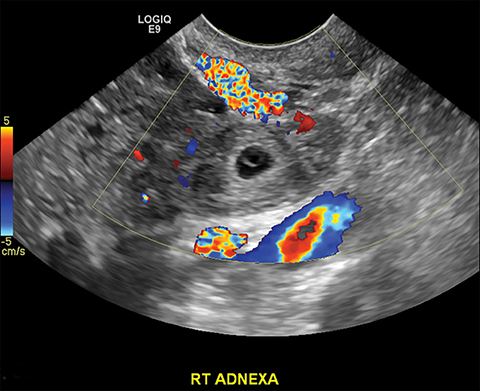 The ultrasound appearance of a hemorrhagic cyst is highly variable based on its acuity and amount of clot formation. The typical acute appearance is of a thin-walled mass with internal echoes, increased through transmission, and no internal vascularity. Over time fibrin strands form and innumerable reticular or linear echoes with a fishnet or lace like appearance can be seen. This reticular pattern is considered diagnostically specific. Given further time, the clot coalesces and retracts presenting as clumped avascular echoes with concave or sharp angular borders in the margin of the lesion. Ovarian torsion is the twisting of an ovary on its ligamentous support, which can lead to compromised blood supply. It is a rare but concerning presentation of acute pelvic pain in women, accounting for 2.7% of gynecologic emergencies.9 Early diagnosis and surgical intervention are important to avoid morbidity; however, nonspecific symptoms and varying imaging features can lead to a delay in identification. Torsion can occur in women of all ages. However, the highest incidence is in reproductive age women and during pregnancy.10 This is believed to be due to the higher prevalence of physiologic and pathologic ovarian masses in this age group. 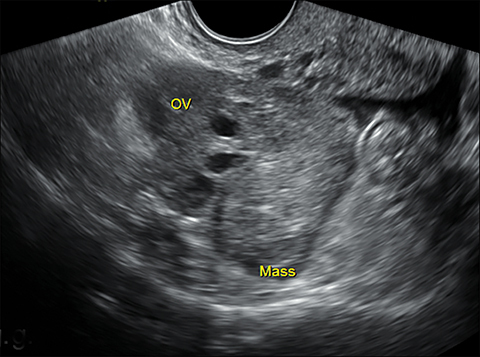 In adults, 50-90% of patients are found to have a coexisting ovarian mass that acts as the lead point for the torsion.10 The classic presentation includes a sharp, unremitting, unilateral, lower abdominal pain with waves of nausea and vomiting. A tender adnexal mass may or may not be palpable. Diagnostic criteria for torsion on CT have not been well defined or confirmed in large studies. 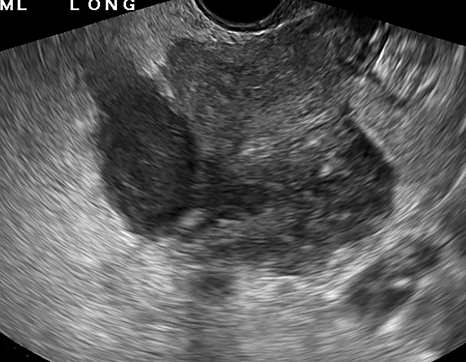 Common findings are nonspecific and include unilateral ovarian displacement and enlargement with deviation of the uterus to the side of torsion. 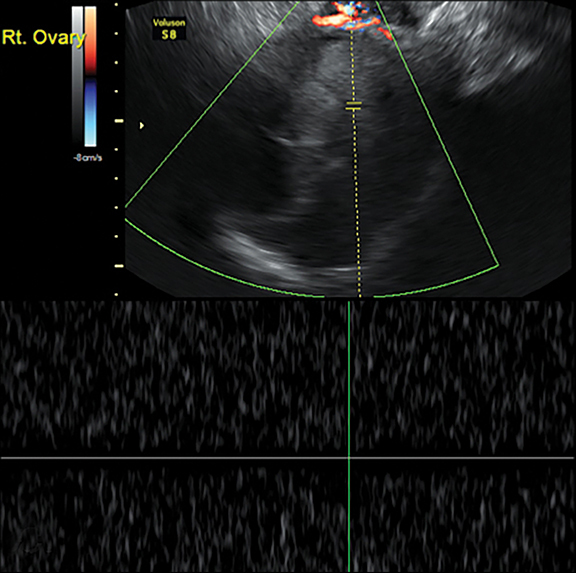 Similar to ultrasound, stroma may appear hypodense with peripheral, hypoattenuating cysts (Figure 5). Other findings include free fluid in the pelvis, lack of contrast enhancement of the ovary, and loss of fat planes. Pelvic inflammatory disease (PID) is an ascending infection of the female genital tract that begins as cervicitis, and can spread upwards to cause endometritis and salpingitis. 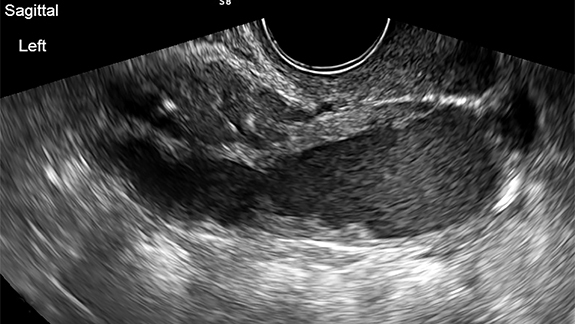 Untreated, it eventually may lead to involvement of the ovaries and formation of a tubo-ovarian abscess (TOA). It is caused by a wide spectrum of sexually transmitted diseases, but most commonly Neisseria gonorrhoeae and Chlamydia trachomatis. PID accounts for as many as 24% of ED visits for acute gynecological pain.14 Symptoms range from none to severe; classic symptoms include pelvic pain, cervical motion tenderness, vaginal discharge, fever, and elevated white blood cell count. PID is most often a clinical diagnosis with the role of imaging to evaluate for complications and treatment planning. Imaging findings can be normal in early or uncomplicated PID. 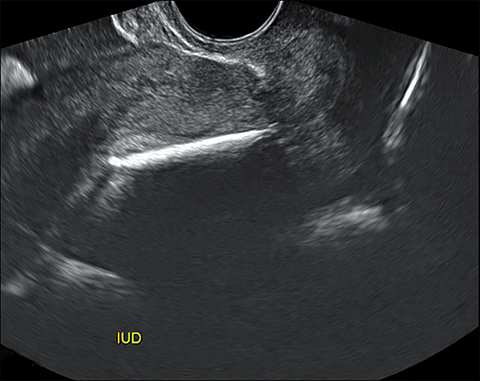 As infection worsens, findings continue to be nonspecific with possible uterine enlargement, obscure uterine margins, endometrial thickening, and fluid within the endometrial canal. 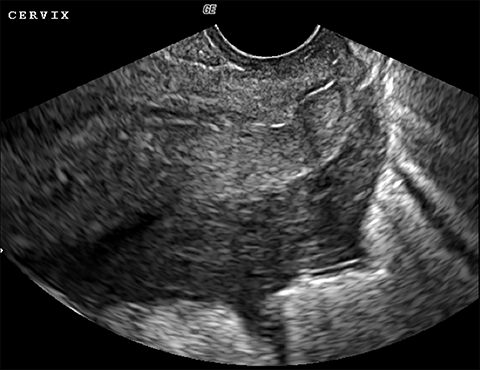 Involvement of the fallopian tubes is typically bilateral and can lead to pyosalpinx. 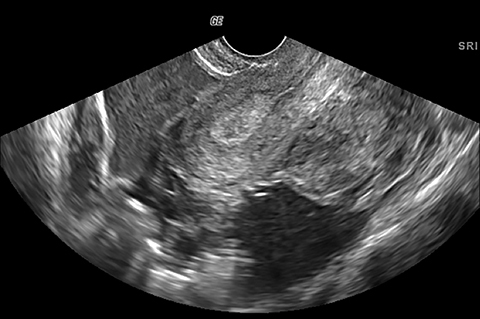 In pyosalpinx, ultrasound can show a distended fallopian tube filled with complex fluid and debris. 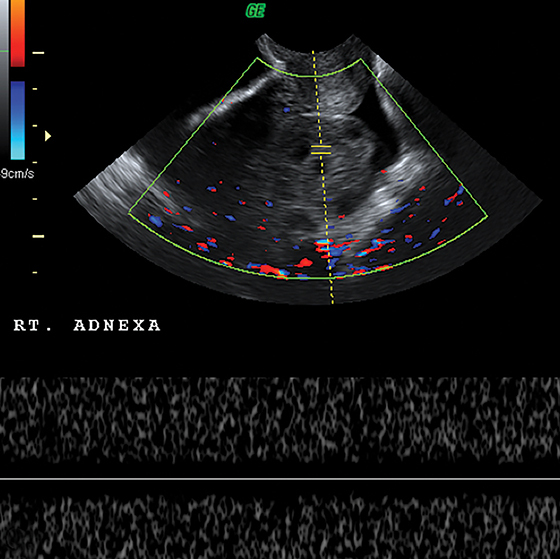 The walls can also be thickened and echogenic with increased flow on color Doppler (Figure 6). As the ovary becomes involved, it enlarges and acquires more edema. 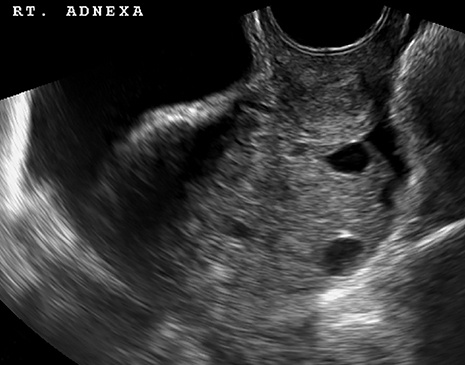 Eventually a TOA may form, characterized by a complex thick-walled, multilocular cystic collection in the adnexa. The walls and septations are typically hypervascular due to inflammation. There is loss of differentiation of the ovary and tubal architecture. 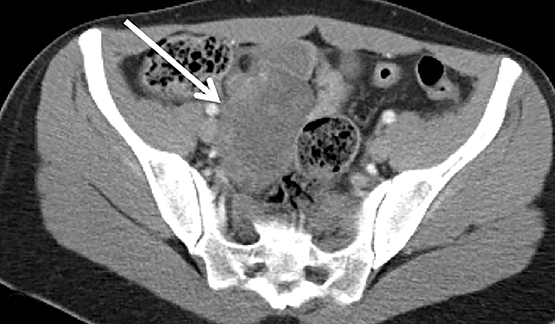 On CT, tubo-ovarian abscesses appear as complex fluid-attenuating collections with thickened and irregularly enhancing walls (Figure 7). Thickening of the uterosacral ligament and fat stranding can also be seen. Other intraperitoneal structures can also be affected by PID. 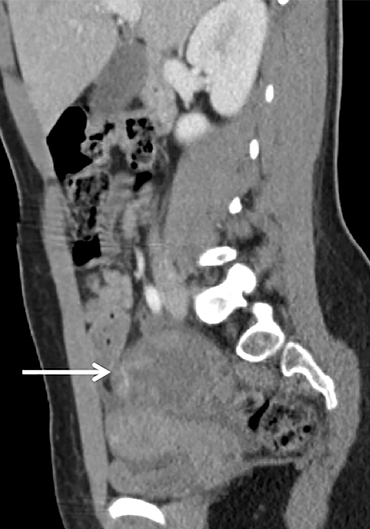 Abdominal US or CT can be used to evaluate for extra-pelvic extension. 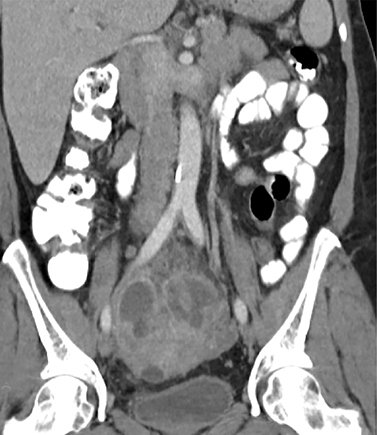 Some of these manifestations include small or large bowel ileus or obstruction, uretral and renal collecting system obstruction, peritonitis, or Fitz-Hugh-Curtis (FHC) syndrome.15 Fitz-Hugh-Curtis syndrome describes an inflammation of the right upper quadrant caused by bacterial spread along the right paracolic gutter or through the lymphatic system (Figure 8). This causes inflammation of the right upper quadrant peritoneum and the right hepatic lobe. 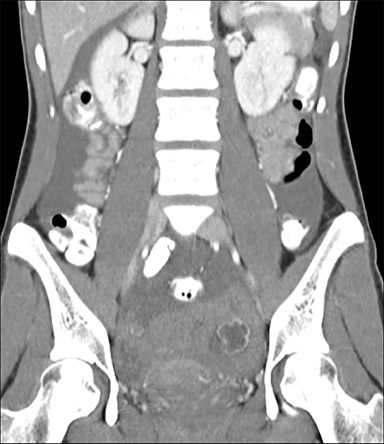 On contrast CT, FHC classically presents with intense enhancement along the anterior surface of the liver and gallbladder wall thickening. 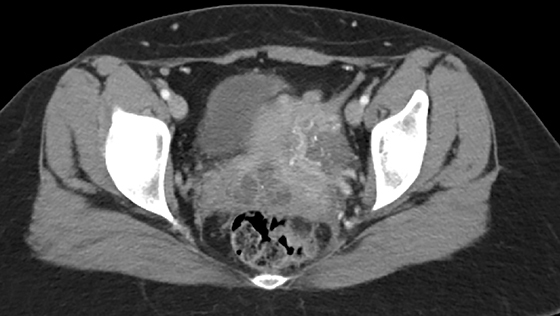 Acute pelvic pain is a frequent presenting complaint in women and often will lead to imaging evaluation on presentation to the emergency department. The differential is broad, spanning multiple organ systems, due to the overlap in presentation of many of the causes of pelvic pain. US is typically the first choice in imaging, although due to the clinical challenge in diagnosis and 24-hour availability, CT may initially be requested. 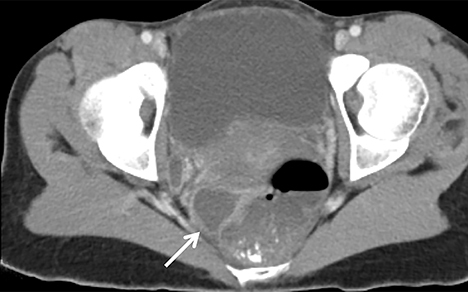 The emergency department or on-call radiologist needs to be able to recognize the US and CT appearance of the most commonly encountered causes of acute pelvic pain, particularly those that relate to the female reproductive tract. 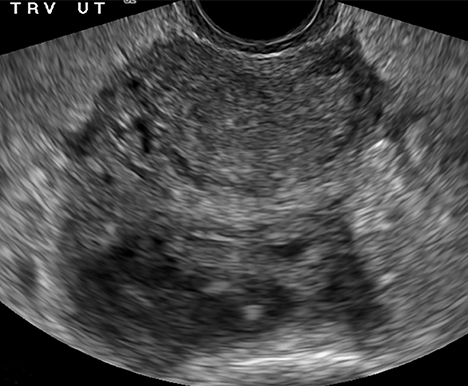 Lin EP, Bhatt S, Dogra V. Diagnostic clues to ectopic pregnancy. RadioGraphics. 2008;289:1661-1671. Doubilet PM, Benson CB, Bourne T, et al. Diagnostic criteria for nonviable pregnancy early in first trimester. N Engl J Med. 2013;369(15):1443-1451. Cicchiello LA, Hamper UM, Scoutt LM. 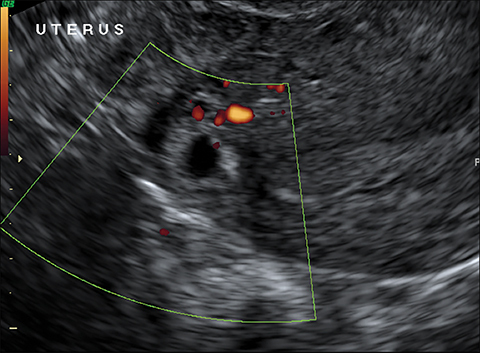 Ultrasound evaluation of gynecologic causes of pelvic pain. Obstet Gynecol Clin Am. 2001;38(1):85-114. Levine D. Ectopic Pregnancy. Radioogy. 2007;245(2):385-397. Barnhart K, Mennuti MT, Benjamin I, et al. Prompt diagnosis of ectopic pregnancy in an emergency department setting. Obstet Gynecol. 1994;84(6):1010–1015. Mehta TS, Levine D, Beckwith B. Treatment of ectopic pregnancy: is a human chorionic gonadotropin level of 2000 mIU/ml a reasonable threshold? Radiology. 1997;205(2):569-573. Abdallah Y, Daemen A, Kirk E, et al. Limitations of current definitions of miscar- riage using mean gestational sac diameter and crown–rump length measurements: a multicenter observational study. Ultrasound Obstet Gynecol. 2011; 38(5): 497–502. Levine D, Brown DL, Andreotti RF, et al. Management of asymptomatic ovarian and other adnexal cysts imaged at US Society of Radiologists in Ultrasound consensus conference statement. Radiology. 2010; 256(3):943-954. Swenson DW, Lourenco AP, Beaudoin FL, et al. 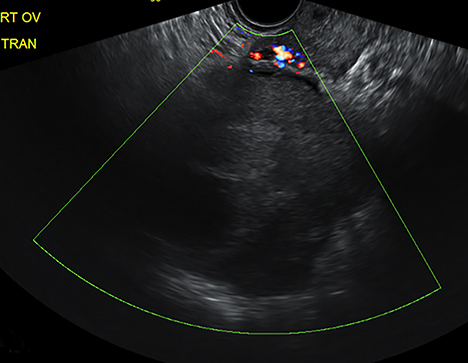 Ovarian torsion: case-control study comparing sensitivity and specificity of ultrasonography and computed tomography for diagnosis in the emergency department. Eur J Radiol. 2012; 83(4): 733-738. Chang HC, Bhatt S, Dogra VS. Pearls and pitfalls in diagnosis of ovarian torsion. RadioGraphics. 2008; 28(5):1355-1368. Pena JE, Ufberg D, Cooney N, et al. 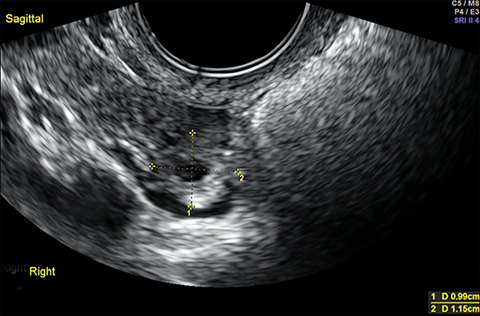 Usefulness of Doppler sonography in the diagnosis of ovarian torsion. Fertil Steril. 2000;73(5):1047-1050. Bar-On S, Mashiach R, Stockheim D, et al. 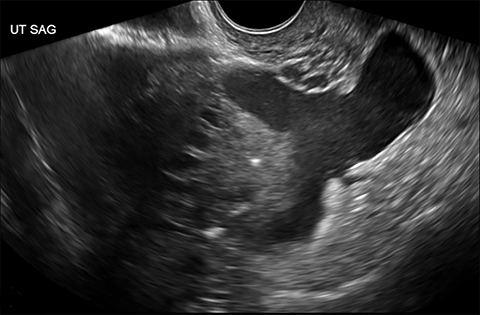 Emergency laparascopy for suspected ovarian torsion: are we too hasty to operate? Fertil Steril. 2010; 93(6): 2012–2015. Shadinger LL, Andreotti RF, Kurian RL. 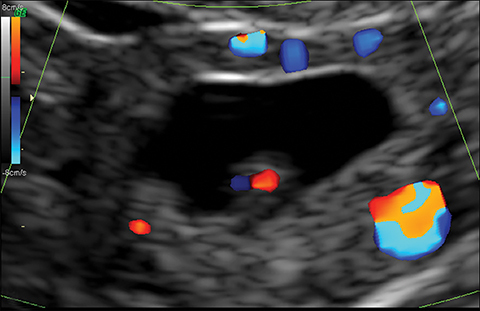 Preoperative sonographic and clinical characteristics as predictors of ovarian torsion. J Ultrasound Med. 2008;27(1):7-13. Potter AW, Chandrasekhar CA. US and CT Evaluation of acute pelvic pain of gynecologic origin in nonpregnant premenopausal patients. RadioGraphics. 2008; 28(6):1645-1659. Sam JW, Jacobs JE, Birnbaum BA. 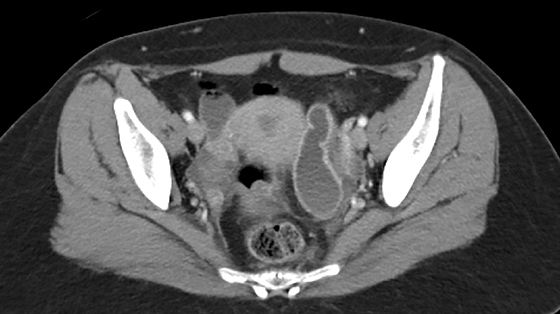 Spectrum of CT findings in acute pyogenic pelvic inflammatory disease. RadioGraphics. 2002; 22(6):1327-1334. Egusquiza JD, Durso AM. Imaging evaluation of acute pelvic pain in the emergency department. Appl Radiol. 2017;46(5):9-14.